Benicio del Toro will appear in the upcoming Guardians of the Galaxy, and if all goes well he may be a recurring character in Marvel Studios' big budget superhero films. 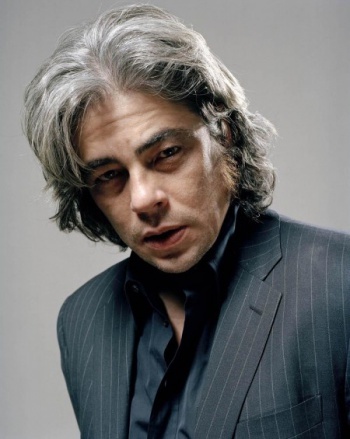 Deadline reports that roguishly handsome actor Benicio del Toro will join the cast of the upcoming Guardians of the Galaxy film adaptation. Unlike the addition of Karen Gillan, which we reported on earlier today, the deal del Toro has signed not only places him in Guardians, it also ensures that should the film be a success del Toro could become the next major actor tied to Marvel Studios superhero films for the foreseeable future. "[Marvel Studios] are keeping his role under wraps, but he's playing a character that is built to be part of future Marvel films, which means he has signed a deal with options that put him into multiple movies," Deadline states. The big question now is which role del Toro might fill. We have to assume it's a character with extant, canonical potential to appear in future Marvel Studios adaptations, so that alone narrows the possibilities down greatly. Based purely on fan popularity and prior comic book crossovers the two characters most likely to fit this criteria would be Nova and Rocket Raccoon. The former role seems a stretch for del Toro as Nova is generally depicted as an almost Spider-Man-esque teenager (who just happens to have intergalactic-level superpowers). The latter role however, could be a solid fit for the actor, as he'd really only need to provide the voice for what we have to assume would be a CGI-animated, surly, heavily-armed rodent. While Rocket Raccoon hasn't had much contact with the Marvel Universe outside of his own little space-based pocket, the character is instantly attractive to potential and existing fans - everyone likes anthropomorphic raccoons - so why wouldn't Marvel want to somehow shoehorn the angry raccoon into future Avengers films? All of the above however is speculation. Odds are solid I've forgotten some tertiary character that would fit del Toro like a glove. Just as soon as Marvel Studios wants to fill us in, we'll bring you more.